P.F. Chang’s is my chain food downfall. Every now and then I just have to have their Lemongrass Prawns with Garlic Noodles (left) or Chang’s Spareribs (below). Last time (these photos are from a couple of months ago), I even placed my order online, for pickup after work that day. It worked lika a charm, and I like the separate takeout entrance on the side of the building (near Marketfair Mall), so I don’t have to navigate the waiting hordes at the front desk. 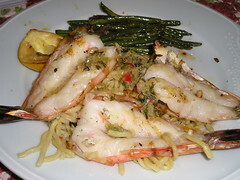 With the prawn dish, the shells and the lemon half, charred by the grill, are essential to the flavor. Next to them (top of plate), you see some Spicy Green Beans. These were interesting because they add some Szechuan “preserves” (pickled vegetables I’d guess). But, overall, the beans were way too salty for me, even for chain food, so I’ll avoid those in future. It’s true that if you check out the nutritional profile of chain food dishes (kudos to P.F. Chang’s for posting theirs online), this is often high-salt and high fat food. And if you do look at the nutritional information, be sure to note the portion size and calculate accordingly – as in realistically. 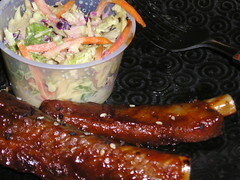 Here, the ribs and slaw are not particularly salty, but the beans have 720 mg. sodium per serving, and the prawns 935. So I only indulge once in a while. But when I do – it is delicious!